J. Robert Barth, SJ, who died on September 21 at age 74, was a native of Buffalo, New York, who first came to Boston College from Missouri in 1985 to be the University's Gasson Professor (his scholarly neighborhood and love was the British Romantics), but who gave up the coherent life of a professor and writer for the deanship of the College of Arts & Sciences in 1988, serving for 11 years before returning to the English department as the McIntyre Chair. From what I have seen, to be dean of a large and diverse college is akin to coaching a youth basketball team at the YMCA: Everyone howls for your attention at once; you are required to assist persons of markedly variant knowledge, maturity, and ability in gaining what they need to better themselves; and you seldom know what good, if any, you've wrought until years have passed. In Fr. Barth's case, however, we already know one great good he accomplished, which is that the arts at Boston College, mostly moribund on his arrival, are now a demanding part of daily life, swelling event calendars and outwearing facilities built to accommodate a campus whose denizens, for various practical and cultural reasons, used to think of art as one used to think of espresso coffee—as something you picked up in Boston or Cambridge, if you had the yearning or need. Stubborn as stone, and himself formed by a primal need for poetry that made him a public declaimer, as well as a reader and interpreter, of the stuff, Dean Barth oversaw the founding of departments for music and theater, turned BC's film studies minor into a major, and forcefully encouraged artistic endeavors ranging from the BC Symphony Orchestra to Irish step dancing and from McMullen Museum shows (the best of which were creations of his diversely gifted and choleric faculty) to slam poetry. As dean, he of course had some money to throw at these projects, and was also able to represent the arts in administrative circles where there was more money to be had. But his support was also deeply personal and even pastoral. I, for one, don't recall a single concert or performance I've attended at Boston College in the past 15 or so years where I did not see Fr. Barth working the room, greeting artists, congratulating faculty, and introducing himself to the parents of student performers. And if you listened from your seat you would hear, through the chatter and the tuning of instruments, Fr. Barth saying again and again, "You must be so proud." But Fr. Barth's most innovative arts legacy is the extracurricular machine known as the Boston College Arts Council, which he founded in 1997 and ran for a while, and under whose auspices campus representatives and practitioners of art forms meet once a month to stir up the best kind of trouble, including the annual Arts Festival (10,000 visitors last year), career nights for student artists bent on lives of meaningful poverty, and awards for alumni and student artists, the most prestigious of the latter being the J. Robert Barth Award, which is given to the member of each senior class who is judged by faculty to have made the greatest contribution to the arts at Boston College. 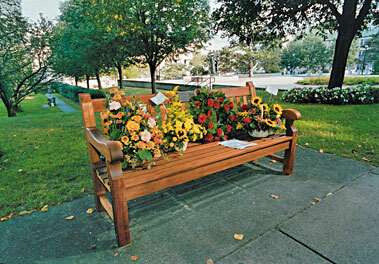 In the weeks after his death, students and others placed flowers on a bench on Linden Lane across from Fr. Barth's former office, in Gasson Hall. The bench itself had recently been dedicated in his name by members of his (large and adoring, one saw at his funeral) family. The plaque reads, "In honor of J. Robert Barth, SJ, who has found a home at Boston College." Those bouquets remain there as of this writing, like tributes cast by a grateful audience onto a bright stage now darkened.